A Jar of Green Herb! I know what you are thinking, and sadly the jar filled with green herb is not legalized marijuana! While Minnesota is making strides with the legalization of medical marijuana we are still aways from legalized recreational use. Yes, someday I hope to write an article espousing the benefits (which there are many) of both medical and recreational cannabis, but this short article is about a very different plant altogether. As I have written about many times before, we grow a diverse array of plants throughout our extensive gardens. Some of them are fairly uncommon perennials, fruiting shrubs, and vines and others are very common plants found throughout many gardens. Its fun having so much diversity, but it is even better when you find a new use for something as simple and common as celery. We have grown celery, Apium graveolens for years now. Typically we have always harvested the ribs for use in soups, stews, salads and roasted vegetables, and have used the leaves as an addition to soup stock. This last summer however, I dried the leaves as a means of preservation. 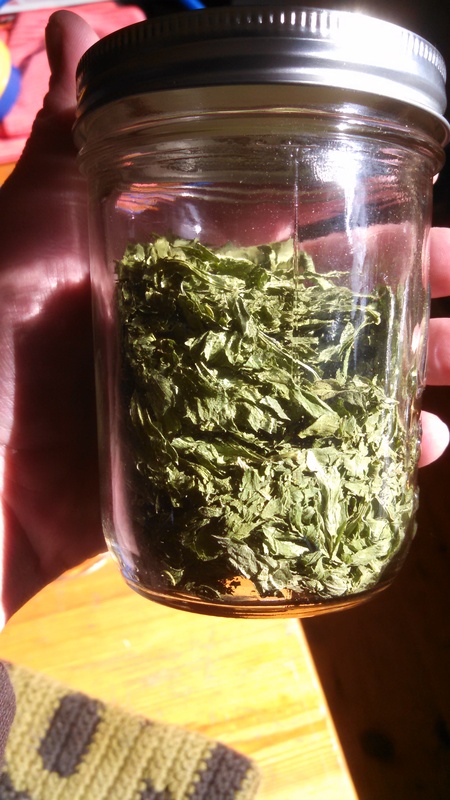 And that is the green herb in the jar, dried celery leaves! The dried leaf of celery has an aroma and taste very similar to when it is fresh, but it is deeper and more earthy as well. This winter I have used it in much of my cooking. It is a great addition to any soup or stew, I have added it to bread dough when I make an herbed loaf, when making rubs for meats it works very nicely with all the other herbs and spices that are found on my spice rack, it adds a depth to veggie dip, and is a great all around herb that I am excited to have available. 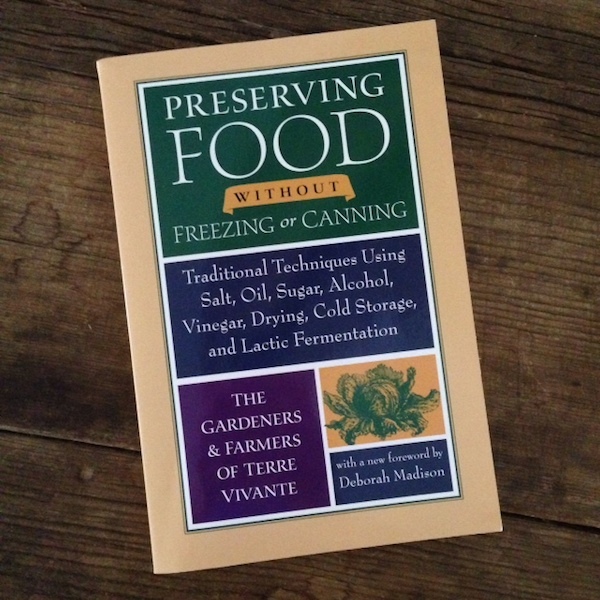 I came across the idea for drying celery leaf in the book Preserving Food without Freezing or Canning. It documents many of the traditional food preservation techniques found throughout France. From lacto fermentation to drying, and the use of oils, salt, sugars, and alcohol in preserving food, it has many great ideas on preserving the surplus harvest from your garden. Its also a fun book, because it so simply illustrates the depth and tradition that is found in European cuisine. Not only do they know how to use all parts of the celery plant, but there are recipes for black currant jam with honey, lemons preserved in salt, lacto fermented veggies, and cherries soaked in brandy. This spring as you begin to plan and plant your gardens keep in mind that there are many ways of preserving the harvest. Some of these ideas won’t be new to you, but others may revolutionize how or what you grow! You may have a treasure just waiting for you that has always been there, and maybe it will look good being kept in a jar! Peace and Cheers! Here is a McIntosh apple, a beauty to behold! A reoccuring theme here on Autonomy Acres is food, a lot of the time specifically about fruit. Fruit trees, fruit shrubs, growing and foraging fruit, and eating fruit have all been topics covered here over the last four years. Its a favorite subject of mine for good reason, I love fruit! Growing it, eating it, learning about it, cooking with it, you name it, fruit is one of my passions. Especially apples! Nothing compares to a tree ripened apple on a cool autumn day. They signal the finished accumulation of solar energy, the life of the soil, and the water from rain into a near perfect orb that holds the sweetness of summer within its flesh. They are the inspiration for poetry and legends, and for so many years have played a part in the stories and traditions of cultures from around the cool, temperate climates of the world. It wasn’t that long ago when every region in the world where apples could and did grow had its own locally adapted varieties. Many of these varieties were used solely for culinary uses or cider and were rarely eaten out of hand and remained nameless, wild apple trees living on the edges of forests and in the hedgerows between fields. But many of them contained desirable traits and magic that enchanted us – a superb taste, or great storage capabilities, or one that made a particularly smooth cider. Some are just plain gorgeous, or ugly for that matter, but any of these apples that have called to us, have been named, and shared, and sometimes have even become famous. Presently in 2014 there are roughly 7,500 named varieties of apples grown throughout the world, but it is thought that at one time (probably not all that long ago), there could have been well over 10-12,000 distinct varieties being cultivated worldwide. But with the steady march of progress and the ever increasing trend towards a global monoculture, much of our collective apple heritage has been lost to the bulldozer, the suburbs, and the destruction of our traditional food systems. While much of our great wealth of apple diversity still exists, it is scattered and gets harder to find with each passing season. The global, industrial cultivation of apples now relies on just 15 varieties for the bulk of its production. 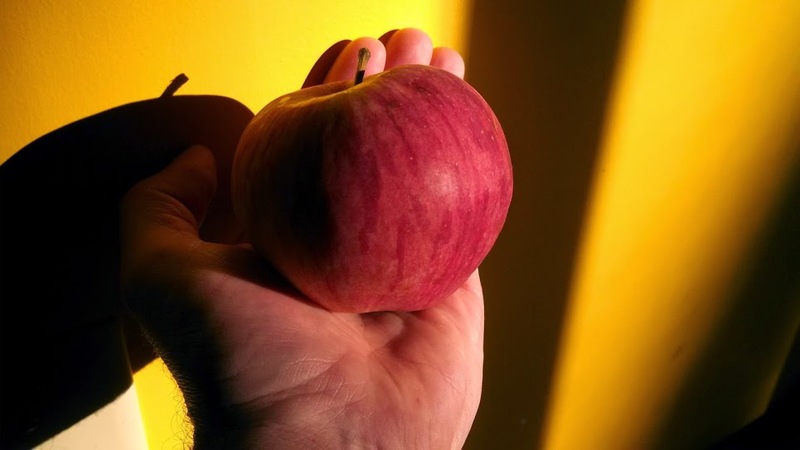 How sad it is to have lost so many unique apples (and the land upon which they grew) in favor of a handful of apples that are easy to harvest and ship, and oftentimes resemble wet cardboard in texture and taste. There is an apple tree a couple miles from my house that I have been visiting now for the last few years. It has been a reliable producer with apples that are hardly troubled by pests or disease. 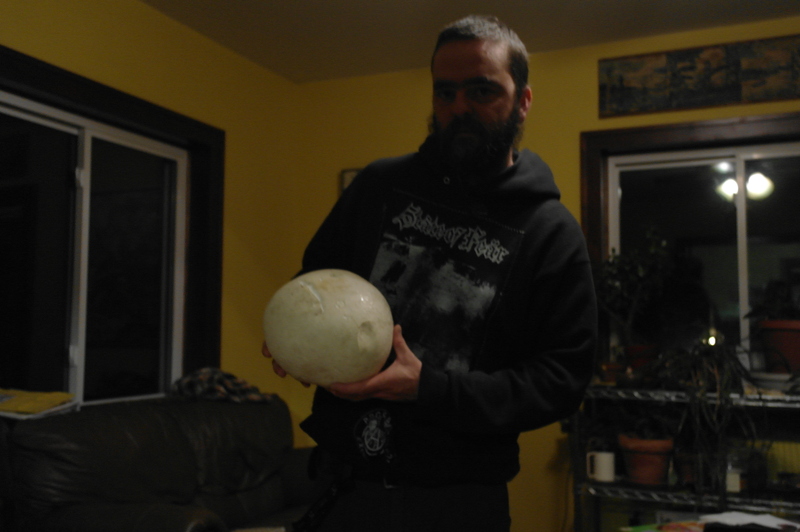 They have tended to be a medium to large apple, but occasionally I will find one that is just huge! This year I got to the apple tree far later than I ever have and realized that I had been picking this apple a bit too early. This year I didn’t harvest until the middle of October, and because of this later harvest, these apples were really ready to be picked and had fully ripened on the tree. What I was really interested in was if I could find a graft line anywhere on the trunk. 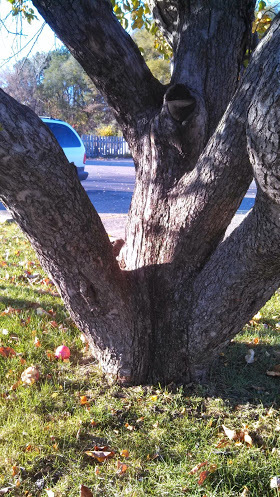 While there is nothing discernible that indicates where the graft union may be (it was probably buried when planted, or slowly covered by the accumulation of mulch and leaves), I am pretty sure that this is a grafted, McIntosh apple tree. Eating it this time of year, versus last year when I harvested them early in September, changed the flavor profile quite a bit, and it became evident that this was an apple that most of us have had at some point in our lives. 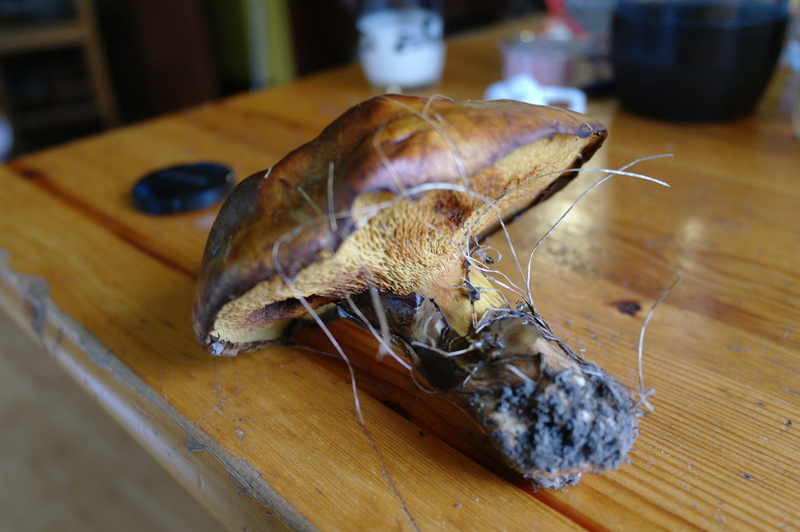 It has a noticeable thicker skin, a white to somewhat yellowish flesh that is far from crisp, but is definitely not mealy either, a small short stem, and is easily bruised when dropped. The fruit tends to have a uniformly deep red color to it, that is splashed with small streaks of green. It is not overly juicy or sweet, but has a nice, subtle acidic bite to it that makes it fine apple for eating fresh. It cooked down to an almost perfectly smooth apple butter that only needed a bit of pureeing at the end. All of those characteristics when compared to other descriptions of McIntosh (see here, and here) seem to be a fairly good match. McIntosh started its journey in Canada back in 1850 and went onto to become a very popular apple for cultivation throughout Western Canada down into New England, and the upper midwest (where I live). It is a large spreading tree, that tends to have reliable harvests, and at least the one I am harvesting from seems to be fairly resistant to some of the more common pests and diseases around here. Honestly it is not the greatest apple I have ever eaten, but it is still pretty good. Just for the fact that this is a big mature tree that is easy to harvest from, and also produces high quality fruit, and lots of it, makes me glad that this tree is in my neighborhood. The fact that this tree is also in a spot that is very easy to access doesn’t hurt either. This tree is a relic from when this area was still farms and orchards and I can only imagine that this McIntosh tree is in its twilight years. Before I came to the conclusion that this tree is a McIntosh, last year I collected scion wood from it and grafted it onto one of my !Frankentrees! At the time of grafting, I was calling it Crusader because of a landmark closeby, but it is now looking like I will have to get a new tag made up for that branch. The fact that this apple tree is a fairly common variety, doesn’t lessen its value as a tree or for what it can provide for one who cares for it. Moreover, the bounty and the knowledge I have gleaned from this tree are invaluable. I love free food, and I also love the chance to learn something new, and this tree has provided both. I admit that it would be fun to find and identify a tree that is more of a rarity than a McIntosh, but the fact that I am pretty certain about my identification means that my observations and research are maturing and starting to pay off! threatened from this unceasing onslaught. 2013 saw a lot of successful gardening and foraging projects, and none were quite as fun to participate in as the apple harvest has been. Not only did one of our trees begin to reach its full potential this year (the Haralson), we also added close to 25 new varieties to our ever growing (but still small urban orchard), harvested multiple varieties from Son of !Frankentree! and located a few other nice neighborhood trees to forage from. From our local bounty we have been eating fresh apples for the last month (and I suspect for at least the next few months to come), are in the process of fermenting about three and a half gallons of cider, have made a decent sized batch of spicy apple chutney, and have began to experiment with drying apple slices. The limiting factor so far in our apple projects has not been a lack of produce to work with, but with not enough time in the day to do everything we would like to try. While most of our trees are still very young, a few of the original ones that we planted well over five years ago are beginning to enter their early prime. The Haralson was the highlight this year. The tree was packed with apples early on, and after an initial thinning out of the fruit, we saw a nice harvest in early September. Most of the apples were in pretty good shape, but there was some internal damage on some of them that was most likely caused by the plum currcilio. Our Rubinette and HoneyCrisp, both about the same age as the Haralson, were much more disappointing. While it seemed early on that the fruit set was going to be great, we ended up losing many apples. The few that made it to harvest were quite ugly and riddled with pest damage, though we did find a small number to at least taste. Bad years are going to occur no matter how much we fight against pest invasion and disease, but it also shows that we have a lot to learn as far as orchard upkeep, maintenance, and overall orchard health is concerned. I have two books that I always come back to when I have a question about fruit tree health and orchard care. The Holistic Orchard and The Apple Grower are both written by Michael Phillips who is on the cutting edge of organic orchard practices and Integrated Pest Management techniques. I have made great strides and improvements in grafting skills, tree planting, pruning, and mulching techniques, but I suspect it will take me the rest of my life to get to a place where I can grow high quality apples on a yearly basis. Ultimately my goal is not the perfect apple, but one that is grown under organic conditions, that keeps pest damage under control and aims to eliminate fungal and bacterial pathogens through probiotic, natural treatments throughout the season. That is a tall order of chores, but one that can be accomplished if given the time, energy, and homework dedicated towards this project. I could keep going on about pests and diseases, organic growing techniques, or about all the different culinary projects you could start using apples, but instead I am going to share with you the best part of this years apple adventure! The results from the First Annual Gathering of the Autonomous Apple Tasters Collective are in! Rubinette – Rubinette is an apple bred in Switzerland in the 1950s. A cross of Cox’s Orange Pippin and Golden Delicious, Rubinette is considered one of the finest apples in the world. A smaller apple that is slightly orange with splashes of yellow and red. Ours were heavily damaged this year, and the kids called them ugly and slightly bumpy. Owen described his first bite as sweet and gritty. Karyn said overripe and mealy. Freya thought they were tart, and I thought they had an underlying sweetness with a mealy mouth feel. This years Rubinette pales in comparison to one we had last year, but I am hopeful that in the years to come we will once again taste this apple in all its glory. Baker’s Square – Baker’s Square is one of the apple trees that we forage from. It is named after the place where it lives, on the boulevard outside of a restaurant here in town. 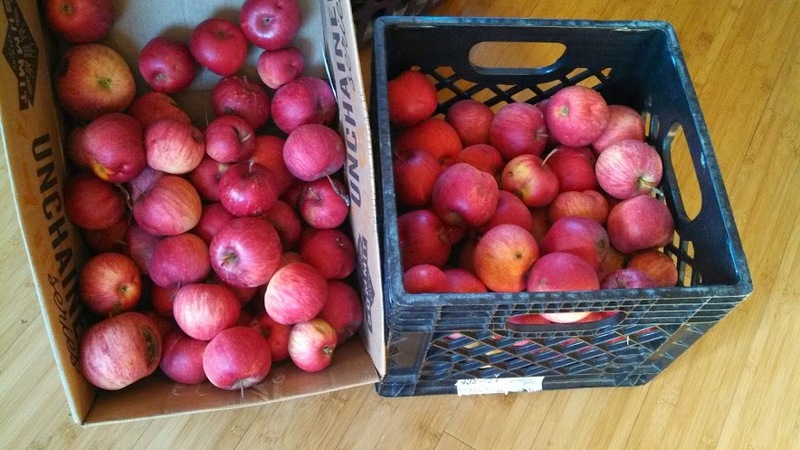 We ended up collecting close to two produce boxes filled with these apples. 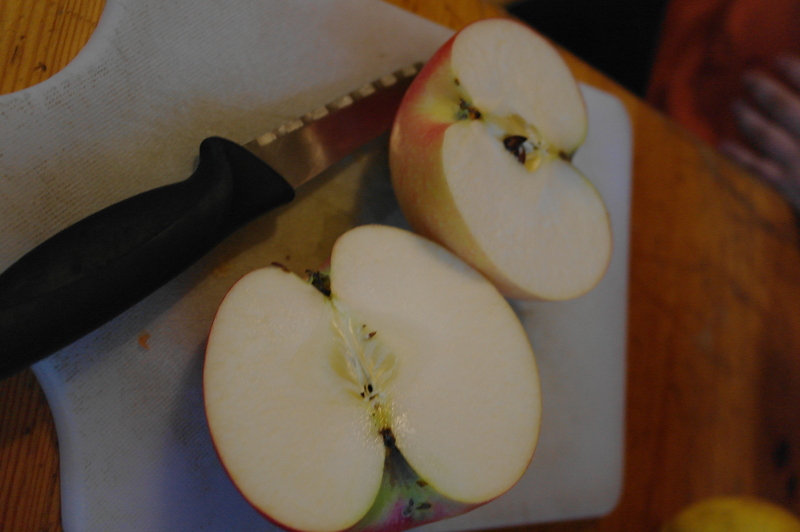 Cosmetically the Baker’s Square apples were nearly perfect. Virtually free of pest damage, and no overt signs of disease. 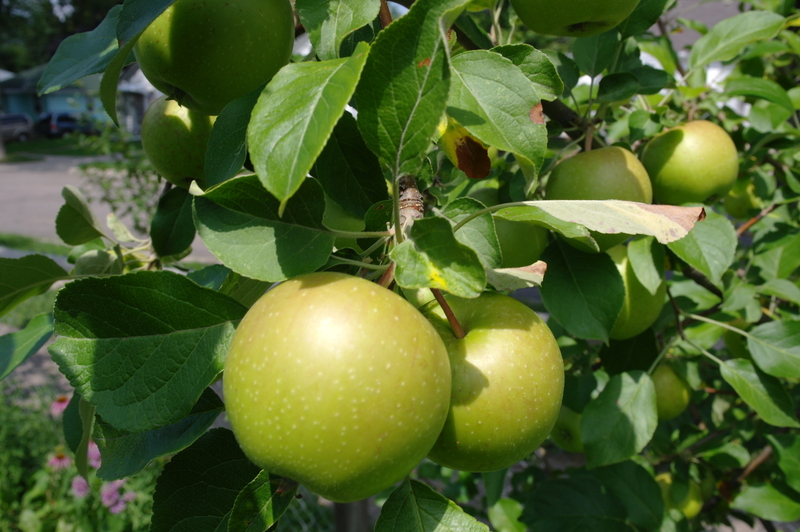 These apples are larger in size, with a green background and a pinkish/red overlay, ripening to a shiny yellow background. They taste like an apple. The kids thought they were sweet, smooth, and fluffy. Karyn was under impressed and thought they were dull, but would be good for cooking. I thought they tasted like cider and make for decent fresh eating. While it is not the best apple I have ever eaten, I will gladly forage from this tree as often as nature lets me. Golden Delicious – This is one of the apples we got off of Son of !Frankentree! this year. We only had one apple to try, and it had a bit of pest damage. Visually it was a small, golden/green apple, that was slightly pitted. Upon the first taste Karyn felt a tartness in the back of her mouth and Freya thought she tasted lime or citrus. Owen thought it was kind of bland, but that may be because it was not the best example of what this apple has to offer. I love me a good Golden Delicious so I am looking forward to a better crop next year. Steele Red – Steele Red is another apple off of Son of !Frank! This apple was a show stopper for us. Karyn described its appearance as rustic, and looking like an old painting, while Freya saw shades of purple and dark reds. When I saw it cut open I described it as looking like a fairytale with an almost perfect white fleshed interior. We were all in agreement that it was very crisp and really sweet with just a touch of sour apple candy in each bite! Great eating that reminds us of what some of the modern varieties taste like, but much better. A real keeper. Wickson – Wickson is an apple that I was turned onto by my friend Steven who writes the blog Turkeysong. 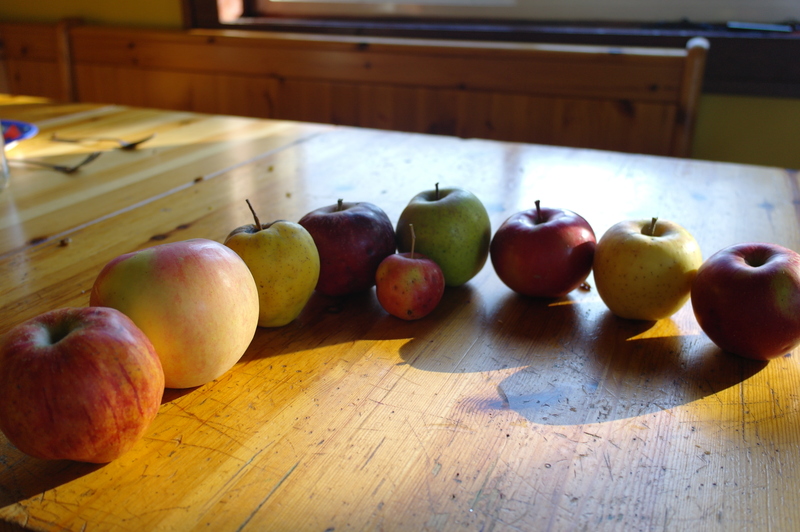 Steven has been kind enough over the last few years to share many different varieties of apple genetics with me, and Wickson is one of them (also harvested off of Son of !Frankentree!). Developed in northern California by Albert Etter in the early 1900s, Wickson is a crabapple with a sugar content of up to 25%! A good addition to cider, or for a sweet treat right off the tree. We only had one to try and it was described as small, darkish red, waxy, very tart, but well balanced with sweetness. Once again, this apple shows a lot of promise in the years to come. Goldrush – I did a review of Goldrush last year with an almost perfect specimen harvested from S.O.F.T.. Sadly, this year’s examples fall short to what we have tasted before. While this years Goldrush apples were beaten up quite a bit, you could still glimpse (and taste) how wonderful this apple is. Crisp, tart, and mildly sweet, Goldrush starts out slightly juicy and finishes dry in the back of your mouth. Eating a Goldrush apple I can just imagine what a hard cider would be like when made with these apples! The Library Apple! A true beauty that deserves a real name …. Library Apple – This is another one of the apple trees that we forage from, or should I say will be foraging from in the years to come. I found this apple the day before our apple tasting while driving by our library. This may or may not be a named cultivar, but my suspicions are that it is a seedling due to where I found it. 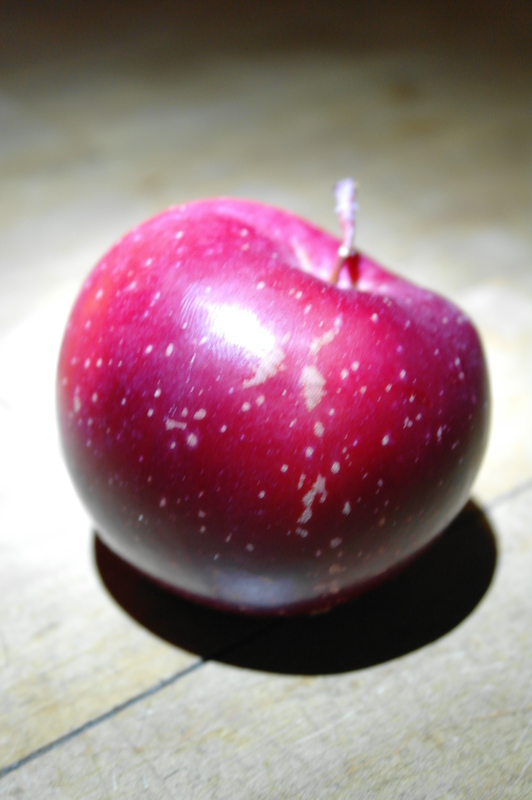 The Library apple is a very dark red, with a smooth shiny skin. There are no stripes and almost looks like a velvety plum. Both Owen and Freya loved this apple and it was described as “The best ever!” Upon eating this last minute entry, the taste did not let us down. It was soft, juicy, and very sweet with hints of berries and strawberries. Library apple will have scion wood collected from it this spring and it will find a home in our orchard for further research and eating. Delicious! Honey Gold – Honey Gold has always been one of my favorite apples. My first introduction to this apple was through the farmer’s market, and since then I have grafted Honey Gold onto S.O.F.T. But the sample we had to taste this year actually comes from a tree that is growing at my in-laws property. The general consensus was that is was very sweet, and well, tasted somewhat like honey. Karyn also got hints of pineapple. Honey Gold is a crunchy apple that is great for fresh eating, and an all round pleasure to have available to us. Haralson – A popular Minnesota apple developed by the U of M in the 1920’s. 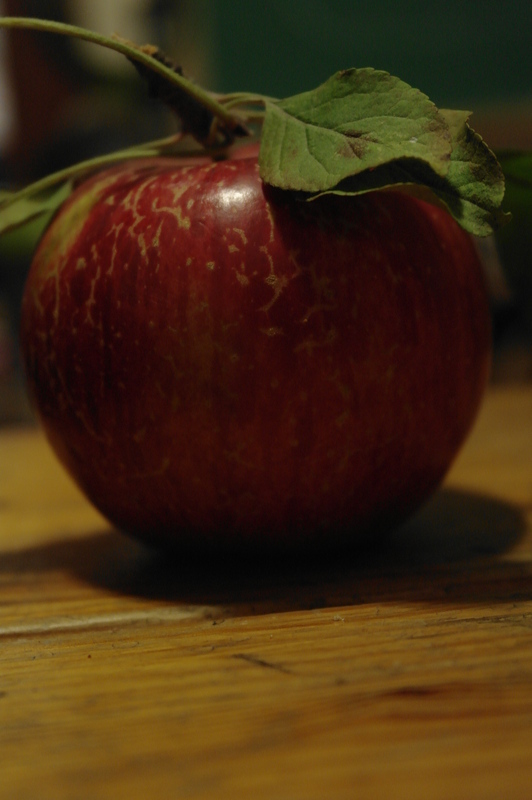 Red and russetting, this apple ripens a bit earlier and does not store super well. So it is with great regret that I report the Haralson fared the worst in this tasting. With words like astringent, bland, and UGHH being used to describe our homegrown local Haralsons you would have thought you were biting into a mass produced Red Delicious purchased from a Wal-Mart! It really was that bad! Part of the problem is that they were starting to loose their freshness due to age. 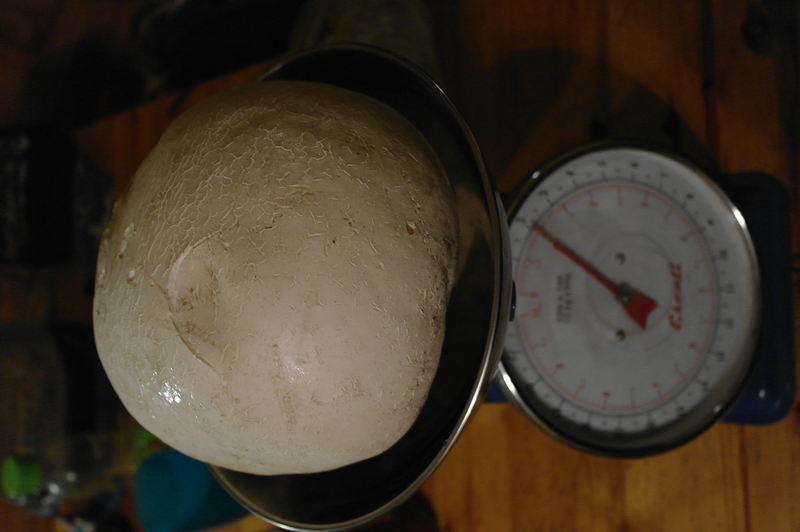 With a shelf life of only a month or two, a Haralson is meant to be used quickly and not put away on the shelf to be eaten later in the year. Haralsons are great, and I know that in the past we have harvested a few really great apples off of this tree. One year of pest damage and disease is not enough to stop me when I know the potential of this Minnesota classic. Here are my two helpers. We spent a morning picking apples off of a tree that we found a few years ago on a public boulevard. The apples are almost perfect, and nearly blemish free. They are large, slightly sweet and great fresh eating! As happens this time every year, I have hit a lull in my writing. Not that there hasn’t been plenty to write about, I just haven’t had the energy to sit down in front of the computer screen and pull all my thoughts together and put them into written words. The summer of 2013 has seen our backyard bees doing great, my wife just picked our first real harvest of Haralson apples, and it has been a very bountiful year for us on our urban foraging adventures which yielded us more than a dozen pints of mulberry jam and close to forty pounds of really great apples gleaned from an old neighborhood tree. One reason for the lack of activity here at Autonomy Acres is that I am now working two jobs, and neither of them are the one that I have spent the last 10 years of my life working at. Back at the end of May I called it quits at the adult beverage factory where I had worked and took the summer off to rediscover what it means to be human. I was burnt out and depressed by the endless daily routine of factory life and knew I had to make some positive changes in the way I live and walk on this Earth. Having a couple months off to gather my thoughts, and to let my body heal was the right medicine at the right time. When I decided to take my life back, it was one of the most empowering moments I have ever felt, and the energy and self knowledge that I gained from that choice has changed my life. I have realized that all the “Things” that society tells us are important and that matter are meaningless. No longer will I let a “job” define who I am as a person. The accumulation of money and “Toys” is not a measurement of happiness nor are they milestones that should be enshrined in our personal stories. Finally, it was reinforced in my mind that nothing is more important than our relationships with our families, friends, and the Earth. While I wish I could say that I am now a gentleman of leisure, relaxing in a hammock sipping cold beer and reading Edward Abbey novels, sadly, I am still just a common worker! I find myself back in my old haunts though – line cooking! I worked restaurants for many years and truly enjoyed the kitchen work, but not the hours. But I got lucky and I am now slinging hash and eggs, cooking up real stocks and soups, and working with a terrific crew of Food Service Pirates at a local music college in the early morning, Monday through Friday. It is nice to be appreciated for my talents and skills, and to also work for decent folks who treat me like a human being, and not a machine; a big change from where I previously worked. I am also pulling a few shifts a week at a “Hip” national grocery store chain. And while I do enjoy this as a part time gig, the pay is horseshit, and the health care benefits I was hoping to get through them just got put through the guillotine because of the implementation of the Affordable Care Act, which translated means – the big bosses saw this as an opportunity to make a shitload of money. At least I still get a small discount on groceries! It is interesting though to see a new side of the food industry that I was previously only a spectator and consumer in. While I have written extensively about the global food supply chain and how it affects farmers and communities, and how it is ultimately not based on sustainable and local means and resources, seeing this first hand has been very educational. freshly picked Haralsons! These are an example of what can be grown in your own yard – No semi-truck needed! It is easy to use Wal-Mart as the poster child for the just-in-time, warehouse on wheels delivery model, but it is everywhere, whether that be a grocery store or a local brewery. Anyone who has spent time researching food, how it is grown, and then how it is shipped to all parts of the world has seen the figures that say if a natural disaster or collapse of some kind disrupts the supply chain, grocery store shelves would be empty in 3 days. Seeing how a grocery store runs, is managed, and is stocked I completely believe this. Our food supply chain is balanced ever so gently on a global house of cards that when it does fall, it will fall fast. It could happen because of the loss of honeybees that is now in the news almost everyday, or it could happen from a natural disaster or escalating climate change, or in a worse case scenario could be triggered by a terrorist attack or a war that shuts down the supply chain. Whichever way you slice it, this scenario is all the evidence anyone should need to dig up that lawn and get growin’ as much of their own food that they can and begin adding a bit of resilience into their lives! To echo past essays here at Autonomy Acres and other sources that touch on these issues, this predicament of global climate change, energy descent and food security that we find ourselves in, need to be looked at as an opportunity to move the human race forward into the future. While it may seem like a futile prospect to think we can take on, and ultimately overcome these challenges, the words of Permaculture Pioneer Geoff Lawton come to mind -”All the worlds problem can be solved with a garden”! It may seem like an idealistic statement, but I truly think that there is a lot of truth and wisdom from such a simple idea as planting a garden. If everyone who has access to a bit of land, whether that be in the city or out in the country began to grow a portion of their own food, we would realize the abundance that this Earth can provide for us. And a garden is more than just growing food. Once you make the leap to becoming a producer and not just a consumer, many other wonderful things follow in the footsteps of a garden. Compost is one of them. Food scraps, garden waste, animal manures, leaves and other plant debris can all be composted and be used to start healing our soils. When our soils are healthy and filled with organic matter, not only can we grow lots of great food, the soil also becomes a living ecosystem, a sponge for holding water, and most importantly a place that can capture and store carbon. When we start to tend the Earth as stewards rather than rulers, and begin to see how humans can have a positive impact on our surroundings, beautiful things begin to spring forth. Where once there were manicured lawns that were maintained by a regiment of poisons and pointless labor, now there can be gardens packed full of both annuals and perennials providing food for humans, habitat and forage for wildlife, and many other products that range from fibers, fuel, and pharmaceuticals. Where once there were boulevards and roadsides, those pieces of land that are cut off from each, now there can be fruit and nut trees, fruiting shrubs, and forage for all the pollinators. These pieces of land can be reclaimed and planted with species that need little to no human maintenance that once again help to feed us, provide us with fuel, store carbon, and heal the soil. My futue looks sweet! 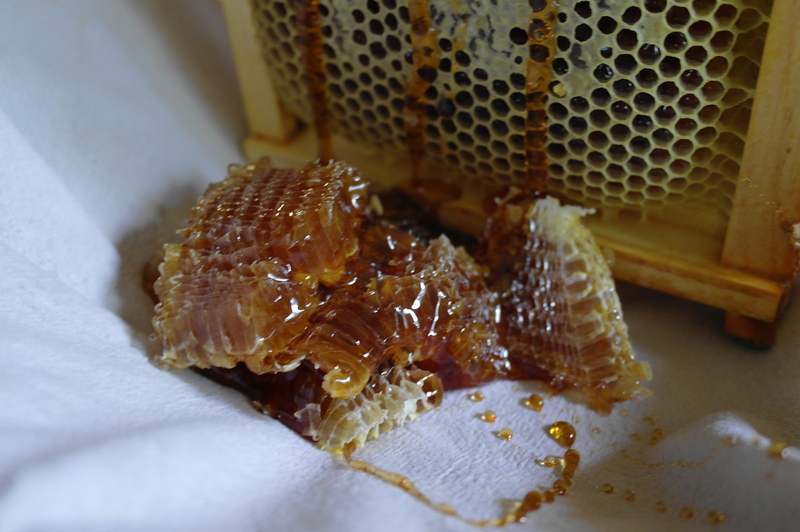 We took one frame of honey this year from our strongest hive. It is a dark, sweet honey, most likely foraged from local goldenrod. The future is full of possibilities. 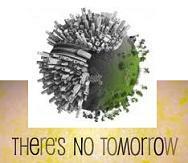 If we continue down the road we are on now, then there will not be a future for the human race. Turning the ship around is not enough – we have run out of time to do that, we need to jump overboard and start anew. It will not be easy, but for the sake of the generations that follow, and all the other critters and plants that call this planet home it is what we must do. Starting over will require participation from everyone. It will not happen because a government or a corporation tells us too. It will happen organically, and from the bottom up. When the people demand an end to the destruction of the planet and are ready to start the healing process, governments and corporations will have no choice but to listen, and eventually cease to be. 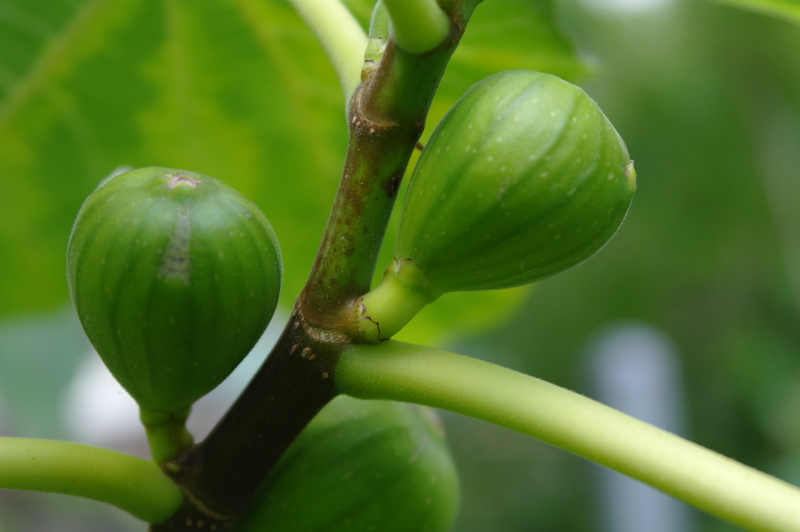 Figs in Minnesota!!?? Stay tuned for more details!! The fruits of our labor are starting to show themselves. Everywhere in the garden that I look, I am seeing fruits and vegetables that are ready to eat, or soon will be. Tomatoes and zucchinis, strawberries and raspberries, kale, and cabbage, and peppers. But more exciting than that are some of the perennials that have been planted over the last five years or so. I began to plant fruit trees in earnest about five or six years ago and have continued adding to the count every year. I started out with a few apple trees and a cherry tree. That first year I planted a Meteor cherry, Ashmead’s Kernel (which was chewed in half), Haralson, Rubinett, and HoneyCrisp apple trees. Since then many more apples, cherries, plums, apricots, cornellian cherries, mulberry trees and other perennial fruits have been added to our foodscape. When we plant annual vegetables, things like a tomato or a pepper or a kale plant, we reap the harvest in the same season. Our culinary desires are realized in one summer of photosynthesis and our hard work of weeding, mulching, trellising, tying, and pest control pay off in the fall when we start to eat whole meals that come right from the garden. But fruit trees are a little different. They are slow growing, and mature at their own pace. Sometimes they get chewed in half by a loving (but stupid dog – sorry Harvey!! ), or they get planted in a bad spot and get moved three times before they find their final home. Fruit trees are a test for us gardeners of how patient we truly can be and how well we design our forest gardens. For myself the wait and patience is starting to pay off. This is not the first time we have harvested fruit from our trees, but this year on a few of our trees we are starting to realize the abundance that our future holds for us! Each year we have harvested a bit more than the last, and with each season the fruit improves in quality (most of the time). A good place to start is our cherry tree. 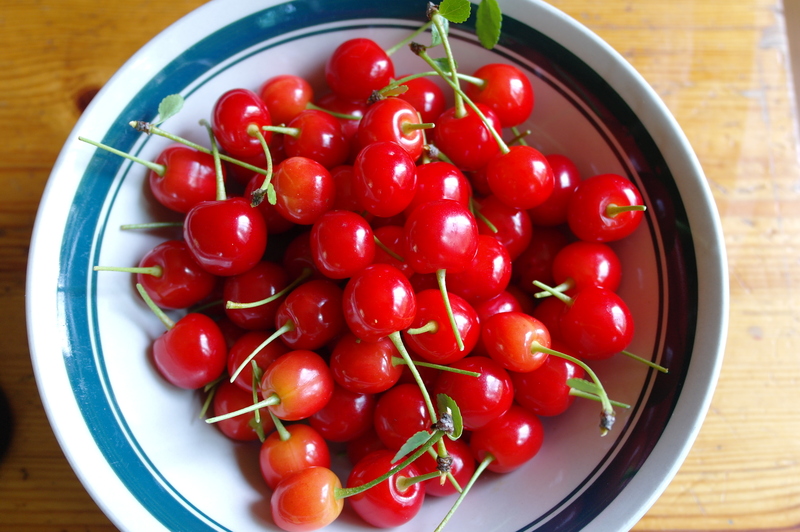 A bowl full of Meteor Cherries! They were delectable in homemade muffins for breakfast! Over the last three years or so we have harvested a handful of cherries each season. Although last year was a complete loss due to a fungal infection, this year, whether it be climate conditions or the tree starting to reach maturity, the tree has bounced back and we have had the best harvest we have ever seen! While it is still a drop in the bucket compared to what we can expect in the coming years, the cherries we harvested this year were in almost perfect shape. Very little damage from pests, and the fungal rot that appeared last year was virtually non-existent this time around. This description is fairly accurate with one major difference – ours is well over 10 feet tall. I have done a lot of pruning over the last three years, but mainly just to open up the interior for airflow and access for sunlight and harvesting. I suspect that in the next couple of years we will start to see the full potential of this tree for two reasons. First is that we now have bees on our property. I believe that our fruit trees have suffered because of inadequate pollination, and second, which goes hand in hand with the bees, is that I have grafted two other varieties, namely Evan’s Bali and Northstar onto our existing tree to aid in that pollination and also planted a Mesabi cherry in close proximity to the Meteor. Many cherry trees are said to be self fertile, but having another tree(s) of a different lineage will definitely help out in proper pollination. Here are some of our Haralsons. There will be much pie consummed this fall!! Haralson was introduced in 1922 from the University of Minnesota fruit tree breeding program and was named after Charles Haralson, head of the program at the time. 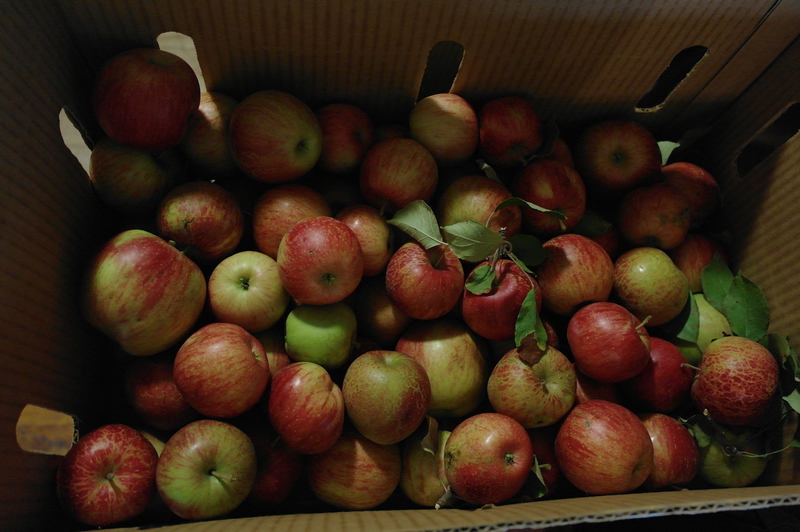 It is an all around good apple, mildly tart that is good for fresh eating, for baking, or as an excellent cider apple. 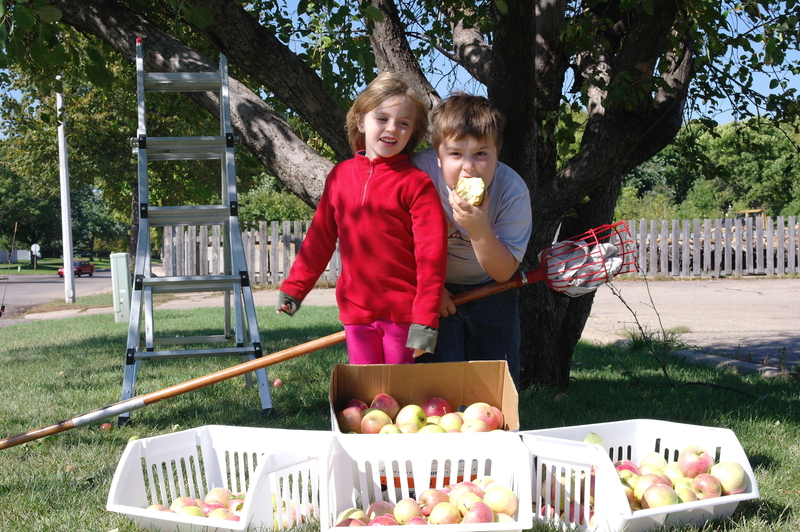 Throughout the years Haralson has become a Minnesota classic and most orchards have dedicated space to this apple tree. I am glad that it is a part of my small orchard and it is finally coming into maturity! The White Niagaras! I can’t wait to taste them!! 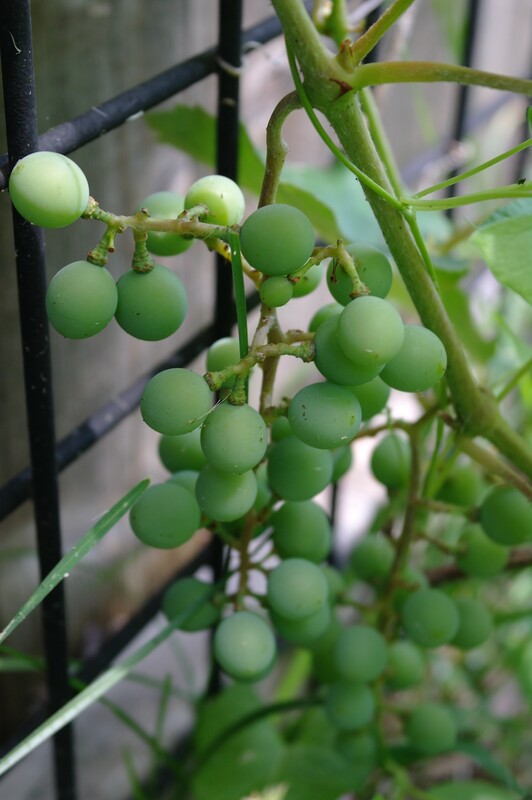 This year also saw the addition of three grape vines planted along a south facing privacy fence we have running through our yard. They are using the vertical space provided by the fence and are part of a guild that contains apricot trees and strawberries. We planted three varieties – Catawba, Concord, and White Niagara and all three are doing great, but the White Niagara is by far the most vigorous. It has put on almost five feet of growth over the last few months, and has a small bunch of grapes ripening as well. Here is all the food I pulled out of my new favorite dumpster!! Last winter I wrote an essay entitled The Tragedy of a Disposable Culture. It was inspired by my observations of a world gone mad by garbage and a particularly good dumpster score at a construction site. I ended up pulling out a bunch of 8 foot 2x4s, 2x12s, ½ by, 8 foot sections of plywood and other random, but useful materials. Some of that lumber has been used in beehive equipment and a lofted bed for my son, while the rest awaits a future project of some kind to manifest itself. My days as a dumpster diver started in earnest back when I was 19. As a poor college student who excelled at missing class due to environmental activism, joint rolling, and hangovers, I had plenty of time to explore the small college town I was living in. On the north end of town there was a grocery store that kept an unlocked dumpster. I stumbled upon it one night and felt like I had hit a jackpot. Inside the dumpster were pre made veggie platters, bagels, and bags of apples. Being the good vegetarian I was back then, this was a great find. I loaded myself up with as much as I could carry and headed back to the dorm to figure out how to proceed. I got my friend Chris to join me, and we headed back up to the dumpster with some bags, warm coffee, and a joint we shared together underneath the stars. That night we made it our mission to liberate as many of those goodies as we could; not only feed ourselves, but to feed as many other college kids as we could find. We loaded up the veggie platters and apples, and also realized there was a whole garbage bag worth of bagels for the taking. Without hesitating, everything that could be salvaged was, and we headed back. As we entered into the main part of the campus, enough people were out walking around (it must have been a Friday or Saturday night) that we decided to just start handing out the bagels. Some people thought we were nuts, but most (being poor college students like ourselves) were grateful for some free food to go along with their beer. We nearly emptied the bag in less than an hour! The next day I gorged myself on veggies and finished the apples, and with what I couldn’t eat fresh, I turned the excess produce into a big stew that contained broccoli, cauliflower, and carrots – nothing had ever tasted so good as that dumpster stew! For the remainder of that year in Wisconsin I would often visit the dumpster. Some days were better than others, but I usually came away with at least a snack to tide me over in those lean days of my failed attempt at higher education. And so that is how I got my start diving into dumpsters. Since those days back in Wisconsin, I have a hard time passing a dumpster without peeking my head in to see what might be hiding down in the deep, dark, and sometimes stinky depths. Most times it is just truly garbage, but on those rare occasions something great is procured – romex wiring and brand new electrical plug-in boxes, boxes of nails, a whole universe of dimensional lumber, box fans, books, extension cords, a multi-tool, cleaning supplies, and five gallon buckets have all been found in my local dumpsters and back alleys. But it hasn’t been since the glorious food dumpster in college that I have had luck in finding high quality food for the taking, that is until yesterday! Yesterday I was doing a bit of grocery shopping at a store that is fairly new to us and our area. While it is not a store I typically shop at, I was intrigued by a flyer we had received with the Sunday paper and thought I would check it out. Surprisingly, the prices are pretty affordable, and if you are an ingredients list reader like I am, most of the products I was interested in purchasing contained a short ingredients list that I could read and pronounce all of the words contained in the list with no problems! I got the small amount of items I had set out for, but was amazed by a few things I noticed while walking the aisles. Almost all of the fresh produce is over packaged – snow peas laid out on a foam tray wrapped up in plastic, individually wrapped cukes, two tomatoes to a tray – you get the picture. Upon seeing this, my mind flashed backed to the dumpster of glory I talked about earlier – that dumpster contained the same kinds of things, over packaged produce that was still good for eating, and lots of it. I paid for my items, and decided right then and there to see if my suspicions were correct. I pulled my small car around to the back of the strip mall, found the proper dumpster, and casually went and stuck my head in. WOW!! Not only were my suspicions correct, they were exceeded by what I saw in there! Snow peas, bunches of celery, cabbage, citrus, and a tray of multi-colored bell peppers that were just out of reach. Being that it was the middle of the day and well past 90 degrees, I quickly grabbed what was within arms reach and got out of there. Checking for cameras as I left (which I couldn’t find), I felt secure about going back later in the night to check back in on the dumpster. On that first trip I left with a perfectly good head of cabbage, a few trays of the aforementioned snow peas, and celery. Because of the heat I ended up feeding the peas and the celery to the chickens, but still a good use of otherwise unwanted food – spoiled veggies turned into egg protein! As day turned into night and I finished my evening chores, I suited up in working clothes, put on my boots, grabbed a flashlight and a couple of buckets and headed back to the dumpster. This trip was even better! 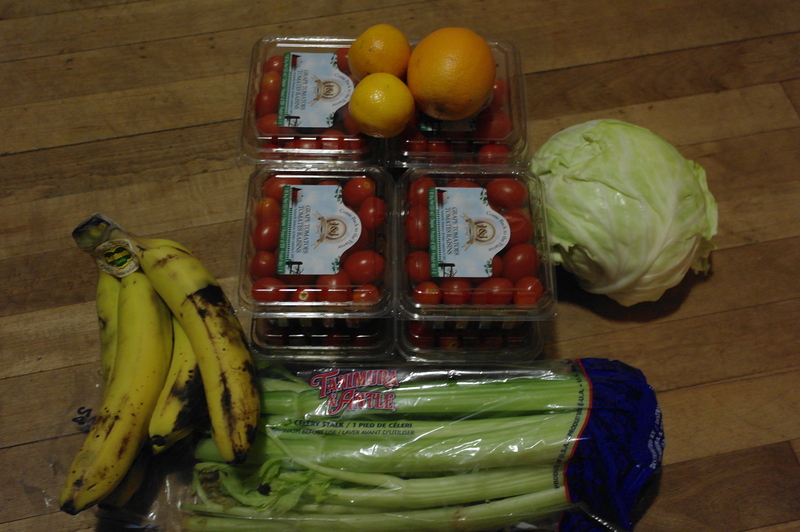 I ended up leaving with 8 pints of grape tomatoes, a bunch of organic bananas, 3 oranges, and more celery. I was stoked! With the tomatoes we are going to make a salad with mozzarella balls, and basil from the garden, and salsa using cilantro and purple jalapenos from the garden as well. The bananas, just slightly soft to eat fresh are going to be turned into banana bread with some sunflower seeds in it, the cabbage is most likely going to get fermented into a small batch of kraut, the oranges are perfect for eating by themselves as is, and once again the celery went to the chickens. What a great abundance of food that otherwise would have been tossed into the landfill. It breaks my heart knowing that this dumpster is filled with food almost everyday. What is even worse, is that there are millions of other dumpsters just like it around the world. Lucky are the ones that are not kept under lock and key and compaction, but most are. So really, the crisis of kids going to bed hungry, and people not knowing where they are going to get their next meal is not a matter of there not being enough food, but a problem of distribution. If a company can’t make money off of the product, it is easier to just toss it, rather than offering it to food shelves and kitchens or directly to the people. This is insanity, and it is wrong! While this topic is too big for me to tackle in one small essay, there are solutions to this problem of distribution. The group Food Not Bombs who I used to work with back in my punk rock days is one of these solutions. Founded in Massachusetts in the early ‘80s by anti nuclear activists, Food Not Bombs has grown into a worldwide movement of independent collectives that serve free vegan and vegetarian meals at rallies, protests, and impromptu gathering. Lots of the food that FNBs uses is dumpstered and donated, and then cooked up and offered for free to anyone who is hungry. 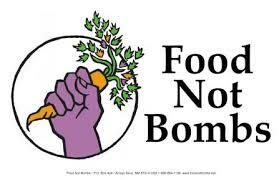 Food Not Bombs, along with many other groups that have similar intentions, are fixing that distribution issue. Just like in Permaculture where we can take the problem and turn it into the solution, FNBs is liberating perfectly edible food from dumpsters and feeding those who are in need of a good, wholesome meal. Not only is this act one of compassion towards our greater community, it is also a shot across the bow of the corporate, food elites. It is taking the food back to where it belongs, in people’s stomachs regardless of who they are or how much money they have to their name. It is hard to imagine what the possibilities might be if all the food that can be found in dumpsters – fruits and veggies, packages of cheese, and crates of olive oil (just to name a few) were to make it into the hands of the people who need it the most. What would happen if everyone went to bed with a satisfied belly? What would happen if we no longer equated the ability to eat with how much money you earn? What amount of resources could be saved if we ate all this food (or at least fed it to livestock or even composted) instead? These are questions we can ponder all we want, but in reality it comes down to one thing – If you have access to a dumpster(s) like this, take full advantage of it. Take what you can and eat it yourself. Experiment with recipes using what you have on hand. In the case of the cabbage, practice preservation techniques like fermentation. Or if you find a bag of lemons, preserve them in salt or make lemonade. The possibilities are endless. If you find more than you can use or preserve, share it with friends or family. If you have a local chapter of Food Not Bombs, or some equivalent organization, donate the food to them and even better, volunteer and get involved (This is something I need to start doing again as well). And if you have produce that is not fit for human consumption, feed it to your chickens or other livestock. Novella Carpenter, in her book, Farm City describes how she fed her two urban hogs a diet of dumpstered fish parts, peaches, and other produce that Bay Area residents discarded on a daily basis. Whatever you decide to do with your dumpstered food, the important thing is removing it from the waste stream and keeping it out of the landfill.